The Alzheimer's society provide a helpline offering advice, information and support : 0300 222 1122. Support Groups - There are support groups in Prescot, Halewood, Huyton and Kirkby. The Dementia society has a search facility so that you can locate local sources of support. Click here to access the search faciity. 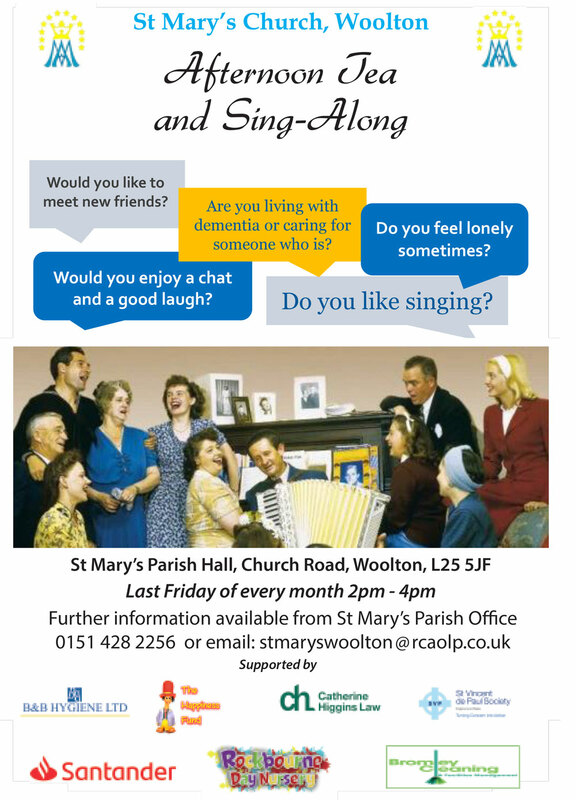 An afternoon tea and singalong will take place in our Parish Centre from 2pm to 4pm on the following dates. The Senior Caregivers Alliance have suggested the following website which carers may find useful: https://blog.taxact.com/tax-deductions-and-tips-for-seniors-and-their-families/ . A promotional video showing the work of the Museum of Liverpool in improving dementia awareness and care.